Thursday September 18th 2014. That is when the people of Scotland will answer the question “Should Scotland be an independent country?” The implications for a Yes vote are vast, with the brunt of the impact obviously being felt within what would be the rest of the United Kingdom. In the event of an independent Scotland however, the European Union as a whole will be immediately challenged in several ways, most notably by legal scenarios concerning Scotland’s potential membership with which there are no real precedents; a situation complicated by an independent Scotland’s potential currency choice. There is also a growing sentiment among some EU members that an independent Scotland within the EU could serve as a blueprint for other potential breakaway nations. With the referendum looming, these are some of issues presented by Scotland that may soon become vital for the European Union. It has been made clear from day 1 by the Scottish National Party and the Yes campaign as a whole that gaining (or retention) of EU membership is both expected and a main tenet of potential independence. This goal, among others of an independent Scotland, has been laid out in regards to the EU in “Scotland’s Future: Your Guide to an Independent Scotland” which was published by the Scottish government in November 2013. The plan, as described in the aforementioned text, seeks to have Scotland’s position within the European Union negotiated and solidified by the potential date of actual independence, 2016. How truly automatic Scotland’s place in the EU would be, however, is not clear. As it is already a member through its affiliation with the UK, there is no doubt Scotland would meet the base requirements of membership required by the EU and with hundreds of years of history as an integral part of Europe, one would be hard pressed to argue Scotland does not in fact present a bit of a special case that deserves to be fast tracked. Where problems could arise however, is how the EU views the membership of both the UK and an independent Scotland in relation to each other. To the European Union, the UK minus Scotland will likely be seen as the successor state to all international treaties including EU membership, with Scotland as a new applicant. The Scottish government, however, will likely view the matter as a simple retention of membership rather than a new application. The importance of this distinction will be paramount to the success or failure of any potential negotiations. If Scotland is to argue that it should inherit the many opt out clauses and rebate programs afforded to the UK, the membership process could become tenuous. Former European Commission President José Manuel Barroso called an independent Scotland joining the EU “extremely difficult, if not impossible”, a stance which was immediately rebuked by the Scottish government and has seemingly been softened slightly since the ascension of Jean-Claude Juncker. Still, many voices are stressing the difficulties surrounding such an attempt, notably Sir John Major, the former Prime Minister of the UK who was involved with the negotiation of the Maastricht Treaty. Speaking on an independent Scotland’s position within the European Union, Sir Major concludes Scotland’s chances of retaining the many opt-outs the UK has negotiated were "nil. That's just fatuous [given] the sheer difficulty and blood that went into getting the opt-outs, and the rebate is under constant challenge". In the scenario presented by Sir Major, an independent Scotland “will be a new nation coming into the EU […] They will have to join the queue. They will have to negotiate and they will have to agree to all sorts of things." The problem for Scotland is that as an independent state, Scotland will lack the kind of negotiating power that the UK wielded during the negotiations that secured such a special relationship with the rest of the European Union. Another issue raised by the prospect of Scotland taking on the role of a new applicant is that all new members to the European Union are required to commit themselves to adoption of the Euro. While there are countries that have dodged this requirement, notably Sweden, this could be a hot button issue within the EU as Scotland has made it clear from the outset that its preference is to retain the Pound, with far more interest in negotiating a currency union with the rest of the UK than with the Eurozone. The UK, for its part, has out rightly rejected the idea of allowing Scotland to continue to use the Pound and has begun to utilize the appeal of its currency as a hardball tactic leading up to the referendum. Thus, it is likely that none of the EU negotiations for which Scotland has set an ambitious potential timeline could be completed or perhaps even begun without the question of currency being answered first; setting the euro up as the first of potential hard lines the EU could take with Scotland in order to green light its membership. Again, this situation has no precedent upon which the EU or Scotland can lean on. It is in many ways the complete opposite of the events surrounding German reunification, where a united Germany was seen as the successor state to West Germany’s international commitments, allowing East Germany to immediately be absorbed into the greater European community. No territory within the European Union or its predecessor the European Economic Community (EEC) has ever broken off to become independent while also maintaining its ties within Europe. In fact the only example of a territory previously subject to EU or EEC treaties gaining independence is Algeria which gained independence from France in 1962 and ceased to be a part of the EEC; a situation that for obvious reasons differs wildly from Scotland’s current place within Europe. In the end, with no formal framework to guide the negotiations surrounding an independent Scotland’s relationship with the EU, Scotland will frankly need to rely heavily upon willingness to negotiate and goodwill from the members of the EU in order to achieve the kind of status that the Scottish government desires; and it is here where the interests of several key EU members will come into play. The fear, as illustrated by Swedish Foreign Affairs Minister Carl Bildt, is that Scotland’s independence will lead to the “Balkanization of the British Isles” and “unforeseen chain reactions” throughout Europe. Put simply, there are states within the European Union that have an active interest in Scotland either remaining part of the UK, or having to go through severe difficulty in achieving full EU membership upon its secession. Notwithstanding the obvious interest the UK has in Scotland not providing impetus for Welsh independence or a United Ireland, there are bubbling separatist movements in Spain (Catalonia, Basque Country) and Belgium (Flanders), among others, that are closely watching events in Scotland unfold. If Scotland is seen to be able to remove itself from the UK while retaining EU membership, or being provided fast tracked access to it, it will embolden these movements to further pursue their goals. The national governments of these states will actively seek to discourage Scotland becoming a blueprint; something which could greatly hinder Scotland’s membership process. Spain has already proven its willingness in these matters through its continued unrecognition of Kosovo. Finally, perhaps the most underreported aspect of Scotland’s potential independence, in relation to the rest of Europe, is how it could alter the balance in a UK vote on whether to leave the EU. At a time when euro skepticism is at a high in the UK, Scotland’s government presents the issue in a much different light. This contrast is highlighted in Scotland’s aforementioned independence guide, which describes close engagement with the EU being “an opportunity for Scotland, rather than the threat it seems to be for some in the UK”. Moreover, according to an opinion poll by Survation from 2013, 68.3% of Scots answered yes to the question “Do you think the UK should remain a member of the EU?”, compared with only 44% for the UK as a whole. Scotland was by far the most pro EU region surveyed. 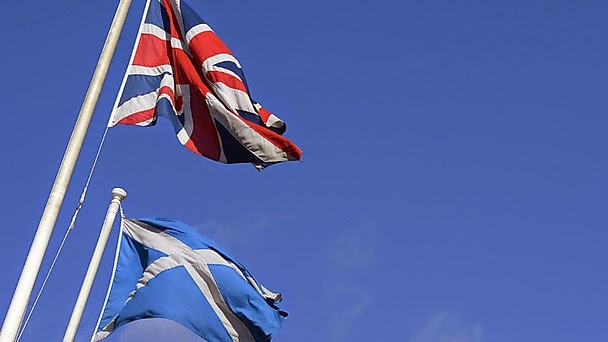 If Scotland achieves independence, it would essentially remove millions of pro EU votes from a future UK referendum on EU membership; the outcome of which could drastically alter the EU. Scotland has a population of over 5 million people, all of whom are currently citizens of the European Union and to reject them in the face of their independence from the UK would seemingly be unrealistic. Indeed, as stated by a report from the European Policy Centre think tank, “no EU member state would have ‘a material interest’ in an independent Scotland being outside the European Union”. Economically it is the only solution that makes sense. The issue for Scotland’s potential within the EU, however, is that there is so much more in play than a purely economic deal for continued mutual benefit. An independent Scotland would be negotiating from a position of relative weakness vis-à-vis the EU, and it would rely heavily on the rest of the EU being amenable to its desires in order to deliver anything close to the EU membership agreement the Scottish government is currently selling to voters leading up to the referendum. For the EU, there is likely too much of an opportunity to renege on the special clauses granted to the UK and too much concern from member states for Scotland to be granted any kind of pass. If Scotland is to vote Yes on September 18th, it could start a negotiating process that would last several years and involve the interests of all the EU’s member states. With the clock ticking down until the referendum, it is important to recognize that the referendum on Scotland is not just an internal matter of the UK, but of Europe as a whole; one that could provide legal benchmarks and treaty precedents which would influence events throughout the continent for years to come. Morgan Breitkreutz studiert Politik und Deutsch an der Universität Alberta (Kanada) und arbeitet bei Open Europe Berlin.